section – thematic grouping of content. A section element is appropriate only if the element’s contents would be listed explicitly in the document’s outline. Each section can have one heading associated with it and include any number of further nested sections. aside – content related to primary content on the page, and which could be considered separate from that content. div – has no semantic meaning at all. It’s just some box, that’s going to have some information. Use for layout purposes. What element to choose and when? 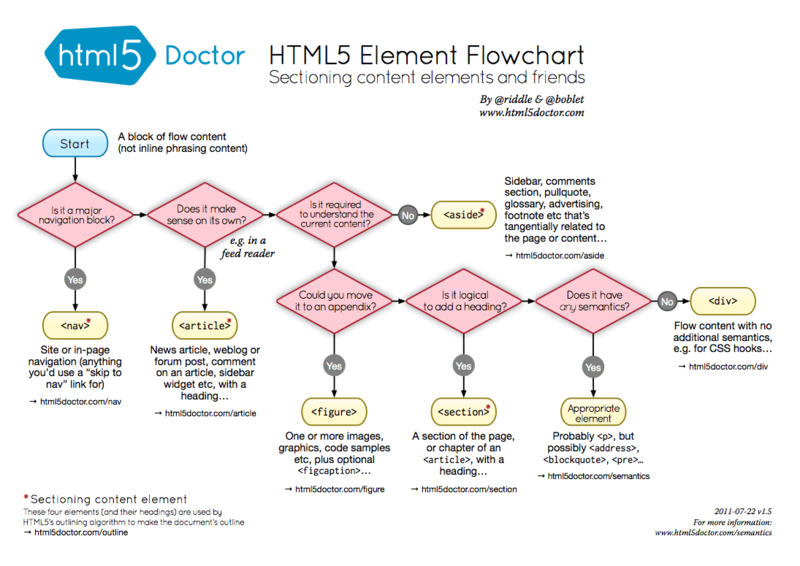 Flowchart published by HTML5Doctor may help. Valid web page (http://validator.w3.org/) means that a web page code follows W3C specification. It doesn’t necessarily mean that the page is semantically correct. link to external resources that enhance the page, e.g. stylesheets, favicons. Link relationships explain the purpose of the link, not just where the link goes to. schema.org is a collaboration by Google, Microsoft, and Yahoo! to improve the web by creating a common vocabulary for describing data on the web. It provides a standardized way to label specific types of content. It means that search engines and other machines can read the information on the page and identify what kind of information it exactly is. Thus it can be displayed accordingly. Google recommends to use Microdata over Microformats and RDFa (answer).